What is the RIANA-CRNA PAC? The RIANA-CRNA PAC was established to increase the political influence of Rhode Island’s CRNAs in Providence and throughout the state. Since non-profit organizations like the RIANA are not permitted to engage in significant political activity and are restricted from making campaign contributions to political candidates, we established the RIANA-CRNA PAC. It operates on the state level just like our National CRNA-PAC operates on the national level. Why do Rhode Islands CRNAs need to have political influence? Rhode Island State Law defines our practice. Those who wish to change our practice use their political influence to change state law. Without political influence of our own, we have no chance of success in preventing legislative or regulatory changes that threaten our practice. We need this influence to defeat, change, or introduce legislation that affects our practice in Rhode Island. The RIANA-CRNA PAC helps CRNAs elect and re-elect leaders in Providence who understand our industry and support our profession. How does the RIANA-CRNA PAC earn political influence? Generally, political influence is achieved by having a personal relationship with an elected official, being able to deliver a substantial number of votes during an election, or making a substantial contribution of money to an election or re-election campaign. The RIANA-CRNA PAC is effective through its use of the latter of the three methods. How does the RIANA-CRNA PAC receive its funding? The RIANA-CRNA PAC is funded solely through the voluntary contributions of Rhode Island's CRNAs. Since funding is not mandatory, the leadership of the RIANA-CRNA PAC Committee must continuously solicit contributions. These contributions are used only for political contributions and nothing else. Member dues do not go to the PAC, only your generous contributions. ​How are the RIANA-CRNA PAC Funds distributed? During the election cycle, the PAC Committee carefully reviews each candidate. We fund those candidates who are interested in our issues, have voted with us in the past, and are likely to do so in the future. We are completely non-partisan with regard to political party affiliation. The decision about how the contributions are spent is made not only by studying the candidates but also through your recommendations. 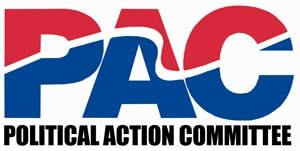 Since this is your PAC, we listen to you about how the contributions are distributed. The best way to help is to make a substantial contribution to the RIANA-CRNA PAC and to inform the RIANA leadership of any personal or professional relationship you have with an Rhode Island legislator. We have a monthly credit card draft program that makes giving easy, painless, and convenient. We also accept single contributions by personal check or credit card. Every Rhode Island CRNA benefits from the efforts of the RIANA-CRNA PAC and every Rhode Island CRNA should fund these efforts. Please do your part today to advocate for your profession and shape its future.